The Pacific Marine and Estuarine Fish Habitat Partnership’s (PMEP) geographic scope encompasses coastal draining watersheds along the U.S. West Coast, extending into the marine waters offshore to a depth of 200 meters. Within this spatial domain, the Partnership focuses its attention on the estuarine and nearshore fish habitats that exist in tidal, subtidal and marine waters. 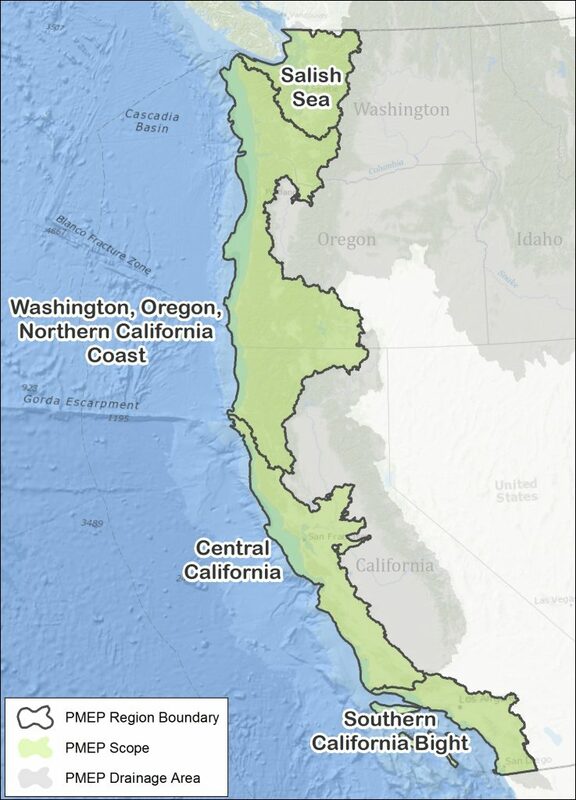 PMEP has established regional boundaries for the purpose of habitat characterization, information synthesis, outreach, habitat conservation and restoration goal setting (Salish Sea; Washington, Oregon, Northern California Coast; Central California, and the Southern California Bight). Regional divides follow watershed and international boundaries and extend out to the 200 meter depth contour in close alignment with management boundaries in use by U.S. West Coast fisheries managers.